That headline is terrible, isn't it? Objectively awful. Sorry. 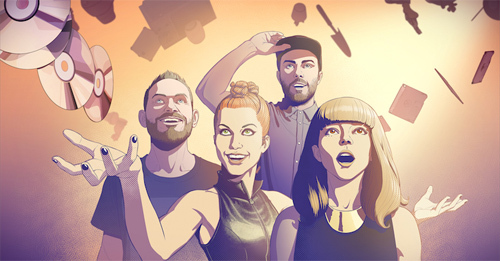 Anyway, the point is this: Chvrches have an animated video for their new single Bury It, in which the band (and guest vocalist Hayley Williams off of Paramore) gain superpowers and soar into the sky like Marvel Synthpop Superheroes. The big question is: Who else is signing up? Will there be an Adam Antman? Cee-Lo Green Lantern? Count Nefariana Grande? Carly Rage Jepsen? Tony Toni Toné Stark? Oh, I give up. Here's the video.